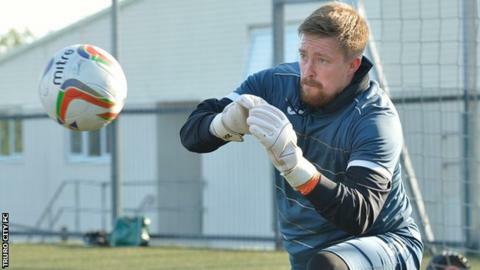 Truro City goalkeeper Martin Rice will not play again this month as he recovers from a broken finger. The 29-year-old, who re-joined Truro City in the summer after four years at Torquay United, suffered the injury earlier this month. "They say it takes three weeks for it to heal," said boss Steve Tully. "He's been out now for 10 days, so we're looking at another 10 days before it's properly healed," he told BBC Radio Cornwall. Meanwhile Jamie Reid's loan from Exeter City has been extended for another month. The 20-year-old forward signed a one-month deal at the end of September.